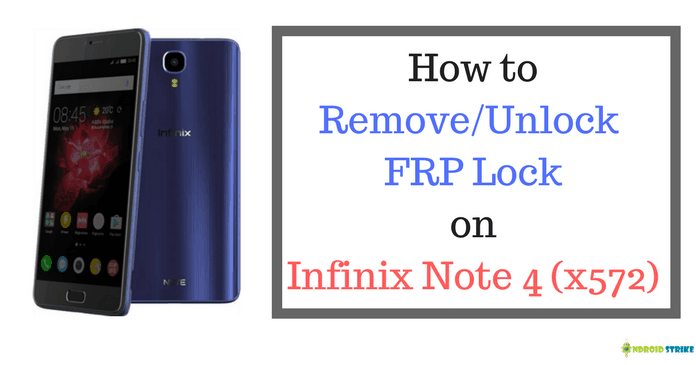 Hey Guys, Today I am with another guide which will help you to remove FRP lock on your Infinix Note 4 (x572 ) device. The reason for posting this guide was to help you with the steps I followed to remove FRP lock on my Infinix Note 4. Yesterday (6th Apr 2018), I was out from the college and switched ON the phone (Infinix Note 4). My Phone Stuck on Bootloader and it was loading continuously about 1hr. Then, I tried to switch OFF the phone by long pressing the power KEY but, the device is restarting and not able to switch if OFF. The wrong thing, I have done is Resetting the Phone. Yes, I have done the Factory Reset and rebooted the device. Again, The phone got stuck in bootloader. Then, I have cleared CACHE from Recovery mode, and it started showing the Android setup interface. To boot your device into recovery mode. Switch OFF the device and hold Power Key + Volume Up simultaneously about 3 seconds then, It shows the broken Android logo, Again, hold Volume UP + Power KEY + Volume DOWN about 4 seconds and release. Now, You can get into Recovery mode on Infinix Note 4. While going on the Android Configuration, The phone started showing lock symbol on the top left corner but, I didn’t care about it, Suddenly, At one point of step, I was not able to continue and not able to login to my Google account. Then, I searched on Google and watched hell lot of videos and read about four tutorials, and nothing has worked to bypass FRP lock on my device. Thank God. Finally, I have bypassed Google FRP lock and Unlocked my Infinix Note 4 x572 model and writing this guide for you guys not to face the same problem like me. This Guide is somewhat lengthy. So, Don’t skip any of the steps. Otherwise, your device will get bricked. To proceed further, You need the help of Windows PC. So, be ready with it. The device should have 70% of battery. SP Flash Tool latest version. No worries, All the links to the files will be given below. You can download it from here itself. I hope this guide has helped you to unlock/bypass FRP lock on your Infinix Note 4 x572. If you face any problem or not able to understand how to proceed then feel free to comment below with your mail ID, I will be there to help you within 24hrs. Also, Don’t forget to share this article with your friends and help them if they face the same problem which I met yesterday. Previous article[Fixed] Unfortunately, How to Fix Google Play Services Has Stopped Error? Please do let me know your problem here. Because the same procedure worked for me and I unlocked the Phone from FRP Lock that’s one of the reasons I have shared the tutorial here. Try to Run SP Flash tool as Administrator. This, not the trick actually. Even if you go to the service center they will do the same process. Also, In some official places, they would flash the device firmware. can you give your whatsapp number ,now im facing this problem. I am not using WhatsApp. But, I can help you in solving the issue. Drop your email here. Can I know What have you done with your device?